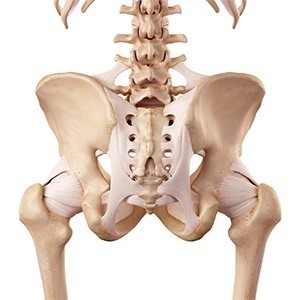 The hip joint is the largest weight-bearing joint in the human body. The thighbone (femur) and the pelvis join to form this versatile ball and socket joint. Muscles, ligaments, and tendons contribute to stabilizing the joint. Ligaments are fibrous structures that connect bones to other bones. The hip joint is encircled with ligaments to provide stability to the hip by forming a dense and fibrous structure around the joint capsule. Cartilage enables smooth movement of the bones and reduces friction. Articular cartilage is a thin, tough, flexible, and slippery surface that covers the weight-bearing bones of the body. This tissue is lubricated by synovial fluid, much like oil lubricates a car engine. A long tendon called the iliotibial band runs along the femur from the hip to the knee and serves as an attachment site for several hip muscles. Osteopathic Manipulative Treatment (OMT) is particularly effective in tight or spasmodic conditions of the muscles and connective tissues, allowing them to return to normal function and relieve pain. With the impingements removed, body fluids flow more freely to nourish and heal painful tissue. Diagnosis is the most important factor in treating any condition. More severe or long-term conditions can be treated with Stem Cell Therapy using the patient's own stem cells. Osteoarthritis: Osteoarthritis is one of the most common causes of chronic hip pain for both athletes and non-athletes alike. It is characterized by damaged articular cartilage that lines the hip joint. Over time, the smooth, protective cartilage of the hip socket wears down and bare bone is exposed, making movement painful. Osteoarthritis is an active disease process that causes degeneration of the cartilage surface. Groin pulls and strains: Hip and groin disorders are more common in athletes and generally caused by rapid acceleration and deceleration motions. The connecting tissues are stretched beyond their limits, resulting in small tears that cause pain and swelling. The rehabilitation time for hip and groin injuries are longer than most other injuries, making early and accurate diagnosis essential. The management of hip and groin injuries is complex due to the presence of multiple anatomic structures in that region. Moreover, the signs and symptoms of most hip and groin disorders are similar making the diagnosis difficult. Iliotibial band syndrome: Iliotibial (IT) band syndrome is an overuse injury resulting in the inflammation of the IT band, a strong, thick band of fibrous tissue that begins at the iliac crest of the hip and runs along the outside of the thigh, attaching to the outer side of the shin bone just below the knee joint. Its function is to coordinate with the thigh muscles and provide stability to the knee joint. Iliotibial band syndrome occurs when the IT band and the lower outside portion of the thighbone at the knee joint rub against each other. It commonly occurs in athletes, cyclists, and runners. Knee pain from this injury is most commonly felt along the outside of the knee and lower thigh. IT band syndrome may also result in a nagging or acute pain on the outside of the hip. Trochanteric bursitis: Greater trochanter bursitis, also called hip bursitis, is a condition caused by inflammation of the bursa that overlies the greater trochanter (bony prominence at the outer side of the hip). A bursa is a small sac filled with fluid that acts as a cushion and allows smooth motion by reducing the friction between the muscles and the bone. The condition causes pain in the outer portion of the upper thigh. It is commonly seen in runners due to overuse, but can also be caused by a fall or other impact, resulting in inflammation of the hip bursa. Patients who have had surgery for repair of hip fracture or hip replacement also experience bursitis. Piriformis syndrome: The piriformis muscle is a small muscle in the groin that runs from the sacrum to the outer hip bone. When the piriformis muscle becomes tight or cramps, it can put pressure on the sciatic nerve that passes underneath the piriformis muscle. Typically, this pain increases when the muscle contracts, when sitting for an extended time, or with direct pressure on the muscle. Gluteal (or buttock) pain is common. Pirformis syndrome is also a common cause of sciatica. For more information on treatments for hip conditions please visit Our Services page.